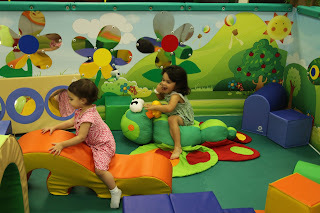 Stories Of A Happy Mom: "Kid's Hub"
It costs $8 for playtime, BUT they offer an annual membership for $25 per family for unlimited access... The food is AMAZING and the service is wonderful as well.. They also offer party packages and special events.. For more information and to see pictures click here. The place is definitely worth a visit! I hope you all love it as much as we did! THANK YOU THANK YOU!! I JUST FOUND A NEW ONE ON FLAMINGO AND PEMBROKE RD CALLED A CAFE AU PLAY THATS IT GREAT TOO!